Rabbi Levi was the first Chabbad rabbi I ever met. Being God fearing and believing but not observant and rather ignorant of many facts about prayers, Hebrew, and customs, I was guarded and respectful but curious. 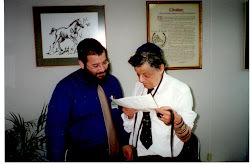 I learned to deeply respect and love Rabbi Levi for the magnificent human being that he was, twinkling eyes, a wealth of optimism, a pious and dedicated man of God and one who made me have an appreciation for one of God's chosen servants. My heart is heavy with sadness on his passing. My memory of the face behind the beard and all he kindly shared with me and my mother will be branded in my heart and mind forever. May God protect you and your beautiful family from further pain. Your father said it so much better than I. This was a real mensch, a beautiful person who will need no introduction to God in heaven. Rest in peace dear Rabbi Levi.